Christmas is a time when local, national and global charities boost their fundraising campaigns which are often targeted at helping the young, the elderly and the homeless during the festive season. Victorian women who were lucky enough to have leisure time very often filled it with what has been patronisingly referred to as ‘good works’. I have written in the past about how female volunteers improved conditions for workhouse inmates and also tried to reform ‘fallen women’ by retraining and finding them alternative work (generally in domestic service). Women were at the forefront of many charitable committees and many were much more than dispensers of tea, sympathy and patronage. It would be lovely if everyone who reads this page clicks on this link to Crisis at Christmas and offers money or time which will make a difference to people’s lives at Christmas, just as the ‘fair ladies’ of the past strived to do. Middle-class women considered participation in philanthropic work as a religious duty, and in many cases an unpaid career which was considered appropriate and also offered intellectual stimulus; they needed little persuasion to become involved a variety of causes. 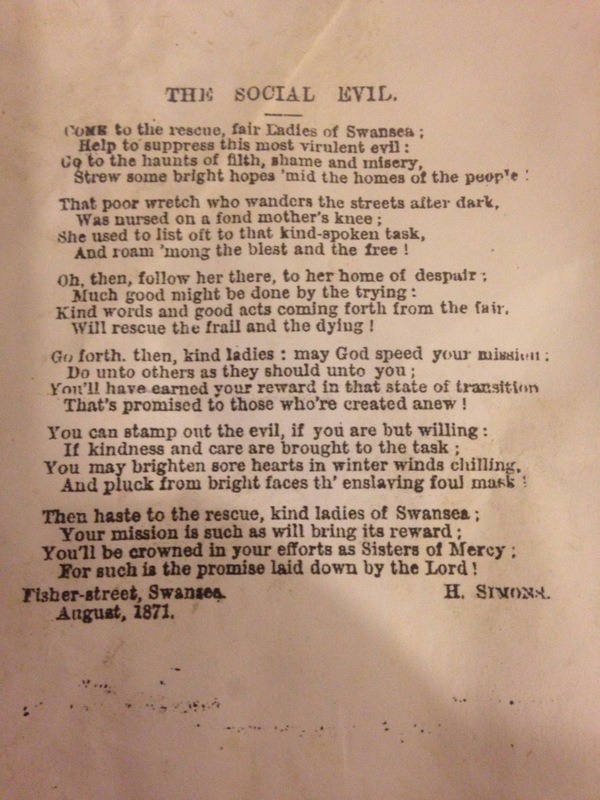 However the poem below is a passionate rallying call for the ‘fair ladies’ of Swansea to go into the streets and rescue women such as the ‘poor wretch who wanders the streets after dark’. I found this poem (below) entitled ‘The Social Evil’ – a euphemism for prostitution – in West Glamorgan Archives a good few years ago, loose in an unrelated archive, and it has always fascinated me. It appears to be a letter in a newspaper, but I can find no trace in any of the publications on sale in Swansea or south Wales. It was written (or at least appeared before his name) by a Mr Henry Simon of Fisher Street, Swansea in August 1871. The 1871 census has told me that he was a printer and compositor, which may explain why it looks as if it was intended for publication. In any case it is very unusual to be able to see the letters newspapers didn’t print. Mr Simon’s poem is written with overt religious fervour and can easily be imagined as a stirring hymn. God will ‘speed their mission’ in the ‘haunts of filth, shame and misery’ and Simon pleads with the fair ladies to ‘strew some bright hope ‘mid the homes of the poor’, and ‘follow her there to her home of despair’. ‘His notice would be drawn to a crowd of unfortunates, either strolling in their dirty, tawdry rags, through the street, or huddled together in the doorway of one of those courts that pour out .their wretched inhabitants in all their filthiness, polluting the very atmosphere which decency and virtue should breathe. Drunkenness, sin, and crime, blare their hideousness in the open day, and morality turns away with a shudder from the loathsome sight’. Living in fairly respectable Fisher Street, Henry Simon was nowhere near the railway station, but in the centre of Swansea. He would of course have been familiar with the poverty and desperation as the he lived near to some of the infamous ‘courts’ that were demolished in the slum clearances in the area of the 1870s. He would have seen and heard the deleterious effects of alcohol from the numerous pubs in the area. Yet, for some reason I can’t see Henry Simon in quite the same way as the hard working ‘fair ladies’ he lionizes, nor for that matter the working-class women who were trying to scrape a living.